I left Knin feeling slightly nervous about my stomach, I didn’t want a repeat of the last time I’d ridden. Thankfully it seemed to hold up and I rode off through the slightly hilly lands on the way to Imotski. Knin it transpired had been a royal town and had a gigantic fort overlooking it which I could see as I left town. The road that day wasn’t particularly exciting but the weather was wonderful and the going good and I was just feeling pleased to be back in the saddle and making progress. That said there was of course still stunning scenery which I was becoming somewhat blasé towards. I arrived into Imotski a little later than I’d planned and was annoyed to find it perched a little way up a mountain so I had some end of day climbing to do. 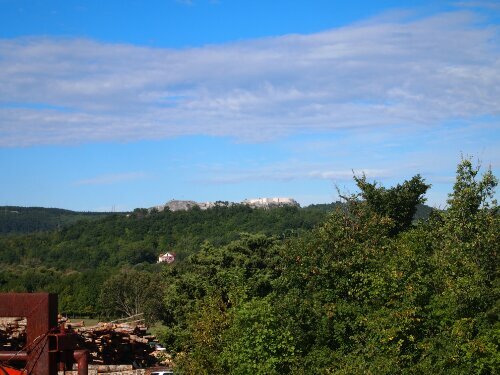 As I wanted to make sure I was recovered I’d decided to stay in a guesthouse again and rode across and up and down the town a few times before I located one; Croatian signs tend to make you aware of the general direction of a place then leave you the challenge of pinning down the exact location yourself. The next day I woke ready for a big day through towards Dubrovnik. I was going to pass through Bosnia having altered my route to take in Mostar. So I set off for the Bosnian border which was very close and passed without incident, having to request a stamp when the border control man didn’t seem to be going to give me one. To start with Bosnia didn’t feel different from Croatia, as you might expect. The further I rode the more little differences crept in, I’d see an occasional mosque for example, also signs began to be in Cyrillic as well as the Roman alphabet. After some climbing and then a really quick descent out of the hills, where I went even faster than leaving the Alps, I reached Mostar. The first large Bosnian town and one famous for and named for its old bridge. Mostar was very different from any of the towns I’d seen so fast in the Balkans. It was a definite tourist destination and it was obvious by the number of tourists littering the place. There were also all the other things which go with tourists like expensive shops and people on the street trying to sell me things I don’t need. The old town of the city was very beautiful though and the bridge stunning, with its high arch across the river. Apparently it had been destroyed in the war and completely restored. 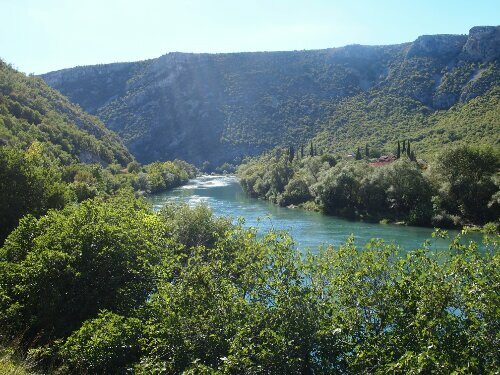 Next I rode hard south once more towards Croatia, mainly following a beautiful river. The road was mainly good but every so often there would be a very badly lit tunnel, some of which were slightly longer than I was comfortable with and where the cars got a little closer than I thought necessary. That night I made it back to Croatia and stayed in a place by the sea called Klek. Rising early I headed for Dubrovnik, I was back on the coast now and had a beautiful sea and Croatian islands on my right. 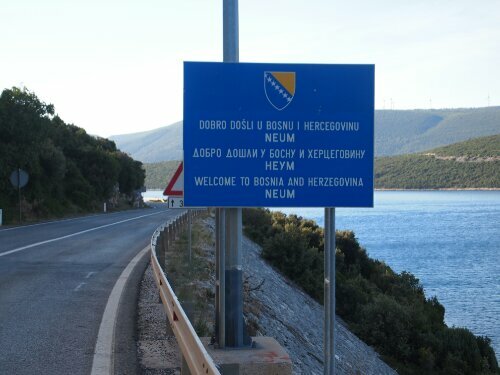 I briefly passed back into Bosnia through what must be up there as one the most pointless token coast lines. 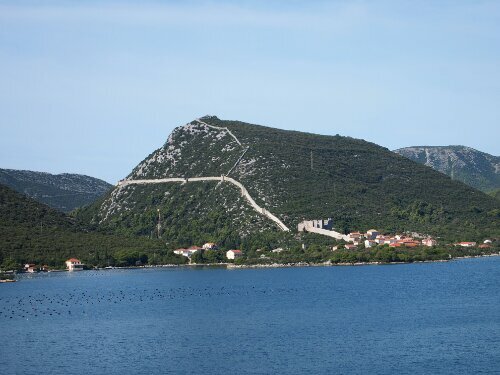 Next up I cycled past Ston which apparently has one of the world’s most extensive town wall networks. 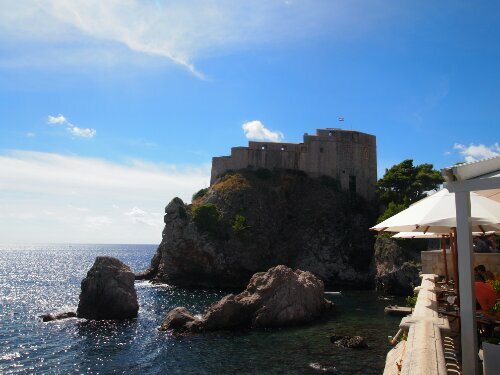 Then I reached Dubrovnik itself. 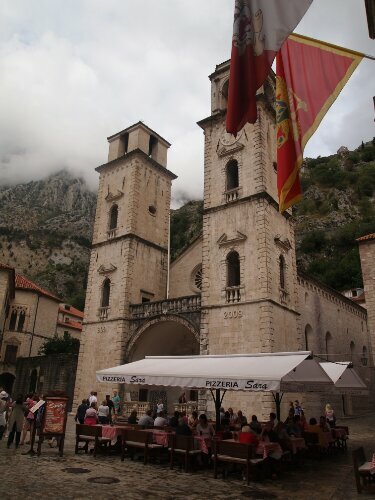 If I’d thought there were a lot of tourists in Mostar it was nothing compared to Dubrovnik. I was told they bus whole cruise ships to visit and I could well believe it. The old town of the city was wonderful though and well worth a visit. The whole medieval part was preserved and ringed round by massive old city walls. All of which was lovely, but the old streets, some of which were very winding had definitely not been built with a touring cycle in mind. Riding out of the city I was lucky to have to climb right up into the hills giving me an incredible view down. 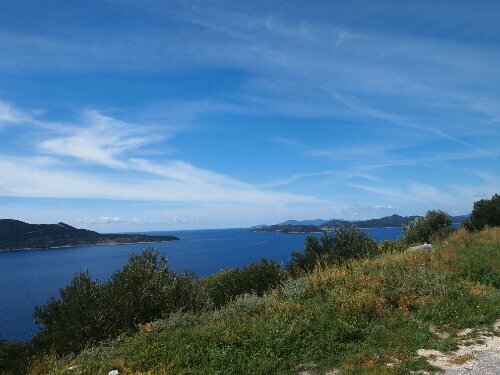 Then having left Dubrovnik I heard towards the small village of Mikulici where I was hoping to stay with a warmshowers.org host called Marko. I was expecting an easy ride there, a hope which was punctured by a very hilly section of coast line and a step climb to 300m where the village was. Marko’s profile had stated that he had room to pitch a tent, luckily it would transpire he had a shed I could sleep in. Lucky because later that night a massive thunderstorm struck. I was glad to have a roof over my head and not be in my tent as torrential rain came down and lightning flashed. 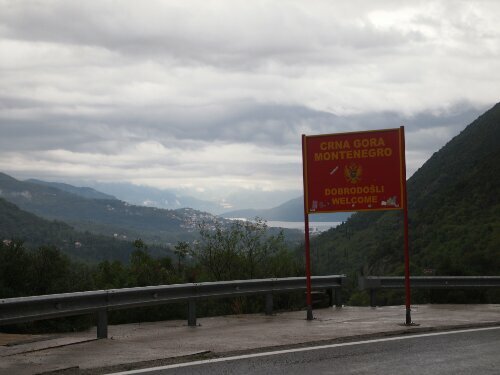 The next morning more rain was expected and it duly came as I made for Montenegro’s border. The predicted downpour was heavy as well and I had to stop at one point before I reached the border to allow it to ease off as visibility got very low. I didn’t even have to ask the Montenegrans to give me a stamp. Sadly my first morning in the country was blighted by rain and I spent the first couple of hours there sheltering by the side of a supermarket, which luckily was open. 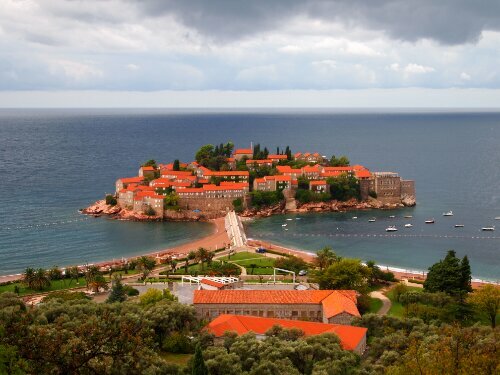 Once the sky had brightened a bit I set off knowing that now I would probably have to spend the night in Montenegro. 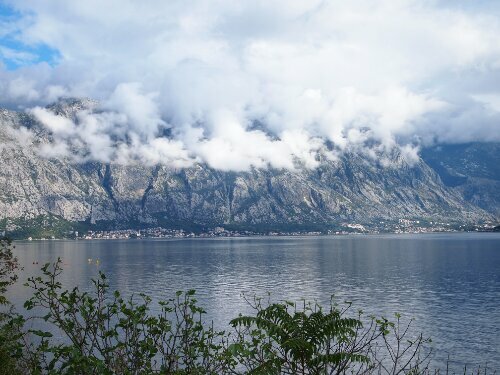 It wasn’t long before I reached the bay of Kotor which is apparently the deepest natural fjord in the Mediterranean and one of the most spectacular sights I’ve seen so far. The mountains rising up almost sheer from the water took my breath away. Earlier I’d been tempted to skip the bay, which I would have to ride all the way round, and take a ferry from one side to the other, I was glad I hadn’t. Around the edge nestling against the looming crags were pretty little villages and in the middle of the bay was a church on its own tiny island. Kotor, the town the bay is named for was interesting but a little like Dubrovnik light. It’s surroundings were far more interesting. After leaving Kotor I had to climb up and over the mountains behind the city and got a stunning view of the town and the bay. Sadly I didn’t get a photo as it was starting to rain… again. 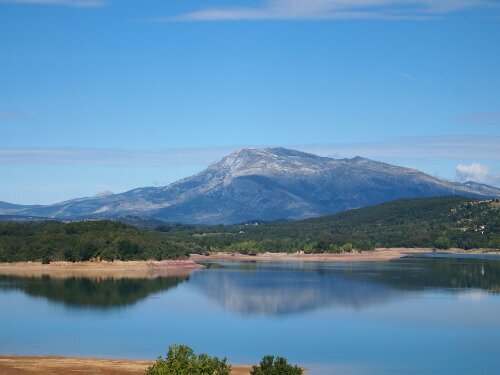 Once over the mountains I was back on the Adriatic coast, I headed to Budvar and stayed the night there. The next morning I was ready for rain again. Montenegro will definitely stick in my mind as a very wet country. And very hilly. The coastline was like a rollercoaster and I would end up doing 2000m worth of climbing for the day. Leaving Budvar I was immediately drenched, luckily my waterproofing was still holding up so safety was the only worry. Not wanting to lose any more time to rain I carried on and thankfully there were only the occasional strong showers throughout the day. An hour or so in I saw a group of four other touring cyclists attempting to lose a dog that wanted to follow them. Luckily they were headed in the same direction as I and after partial introductions I carried on with a French couple, a German and another Englishman. At the first hill we became a bit strung out and by the second we’d lost the German and one half of the French couple. By the third hill it was just me and the other English guy who introduced himself as Will at the next town. We decided to carry on together on the basis we probably wouldn’t get very far if we waited for the others. As we rode I learned Will had been touring for over three months and he’d ridden all the way down to Morocco before taking a ferry to Italy to continue in Europe. I also learned he’d dumped a lot of gear lowering his weight and that thin tires and SPD clips make a lot of difference to speed as I struggled to keep up on the flat. Luckily for me as stated there wasn’t much flat that day. 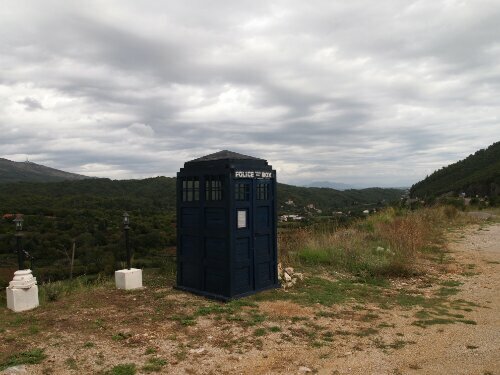 As we went we stopped at a café that randomly had a Tardis outside. I’d have asked why but my Montenegrin wasn’t up to it. After that we made good time given the terrain and rode on through Montenegro to the next country Albania. So it was goodbye to former Yugoslavia. September 20, 2013 in Countries, Cycle touring, Europe.